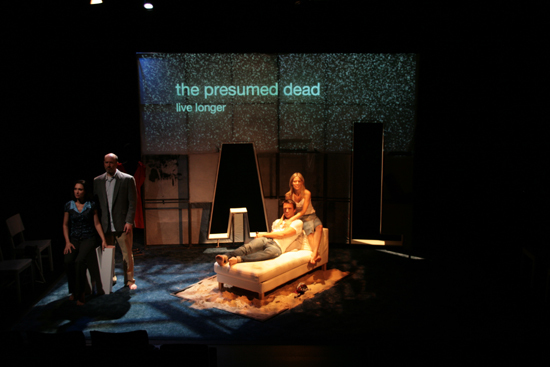 International Culture Lab’s production of Outside Inn had traveled through many incarnations to its Off-Broadway premiere. The University of Pittsburgh, ICL and Theater Rampe Stuttgart originally commissioned playwright Andreas Jungwirth to create a text to serve as a vehicle to explore cultural difference among the collaborators and their respective countries. From its conception, the project called for four bilingual actors to perform the play in both languages on both continents. 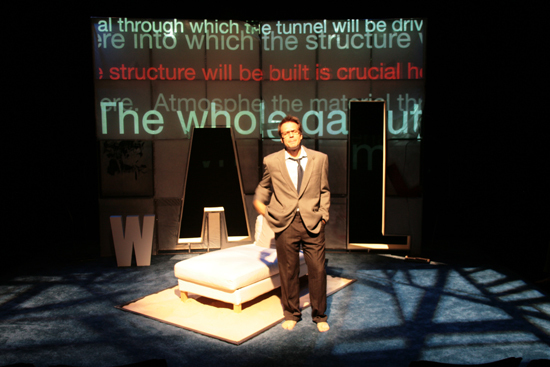 Outside Inn rehearsed and previewed at the University of Pittsburgh in September 2007, where it played two German and three English language performances. It then traveled to Stuttgart, Germany, where it played at Theater Rampe Stuttgart in the month of October 2007, including five performances in English and one impromptu mixed-language performance. This mixed-language version was further rehearsed and then returned to Stuttgart July 1-5, 2008, as part of the first annual American Days, sponsored by the German-American Center there “to further improve and intensify the transatlantic dialog.” Throughout the project, language evolved into a dominant creative element that drove and shaped character development, rhythm and tone, and actor/audience relationship. Audience members who had seen the same actors play in two languages had commented on how different the characters seem in one language or the other. The actors, in turn, noticed differences in the ways their characters responded to the same narrative circumstances depending upon the language they were using. As we moved toward the New York leg of Outside Inn then, we wanted to interrogate in a more detailed and experimental manner the role language plays in rendering the story of our contemporary lives. The generous in-kind equipment loan from Digital Performance Institute made this possible. 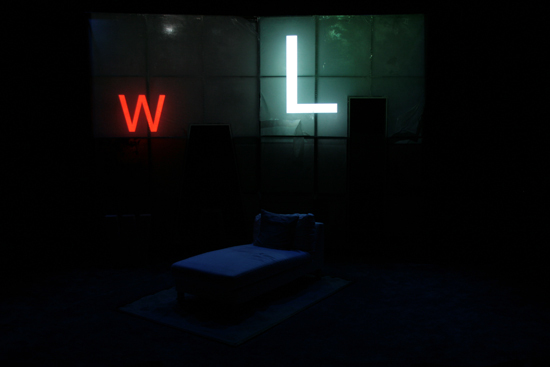 We redesigned the set and decided to use projection to reexamine, among other things, the role and use of supertitles. Need they be only functional? Can they be used to tell a greater story? Can a foreign language be part of the soundscape of a production and thereby ‘translate’ culture not just words? 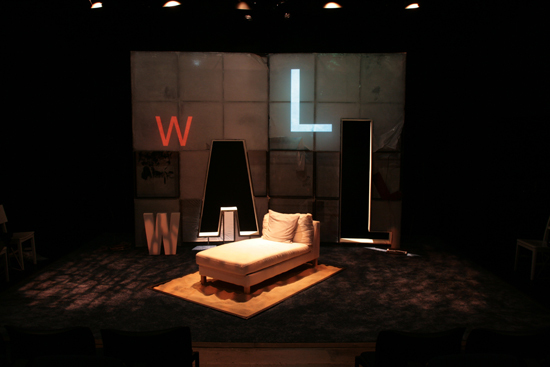 The main element of the set was a 14-foot-long 10-foot-high structure which was both literally and figuratively a wall, with the capital case text letters W A L L stenciled and constructed into the design. This WALL served both as entrance/exit and projection site for text and images. Two projectors mounted in the grid halved the projection area. This binary helped serve our expanded deliberation on and experimentation with translation. 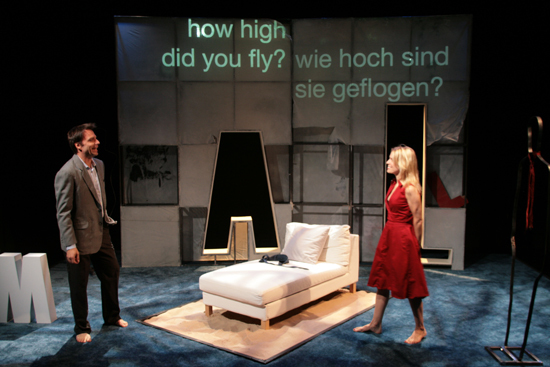 The original German/English duality from the initial stages of the project was minimized in the mostly English-language New York production. Here, the German language was employed as Brechtian device that underlined the twofold spoken/visual rendering of text and story. In our multi-layered, digital age of information, communication has become a complex juggling act. We are able to “text” or “talk” to the whole of the world from the palm of our hand, but the process of “translating” – intention, emotion, culture – has become more challenging than ever in a globalized world. 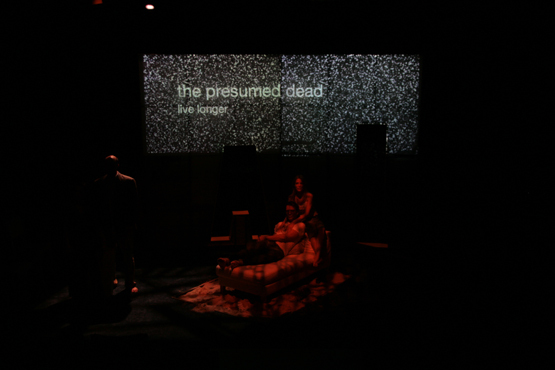 The projection of stock market ticker crawl and current news stories were interlaced with the characters’ representations of their personal narratives. Which is the real or true story? Or perhaps more correctly, which is the realest or truest representation of the story? The representation of text or image on the literal W A L L was used not only to emphasize or complement the story the character/actor was telling, but also to counter and negate, thereby adding a deeper second layer onto the main narrative. The lives of the characters were as fictional or real as “Kalowski,” the unseen arch-capitalist that dominated all their choices. 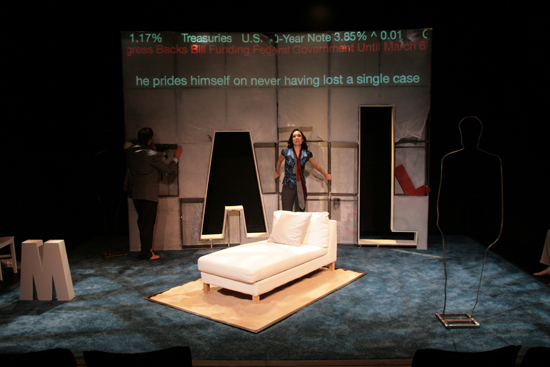 Coincidently, the same financial system that dictated the characters’ actions and personal relationships in the play, was imploding in real time in all the headlines during the October 2008 run of the New York production. As all current news stories suggest, the US and the world are conscious of having reached some kind of historical precipice in the capitalistic system. The globalized economy no longer allows simple nation-to-nation agreements and “translations” of wealth and resources. Just as the communists were the only ones who could screw up communism, only the capitalists could ruin capitalism. Some will argue that capitalism has now entered the same undead zone in which Soviet-style communism has existed in the two decades since the fall of the Berlin Wall.